In the ever changing world of website development and website builders a battle is raging. Raging might be too strong of a word though considering this is about website builders, but both of these elicit strong responses from their supporters. 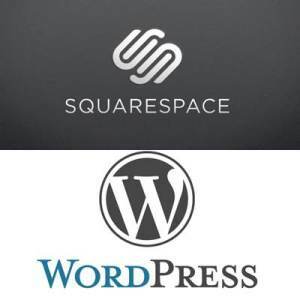 While WordPress has been around longer, Squarespace is quickly making a name for itself as one of the premier website builders on the market today. WordPress made it’s initial appearance in 2003, and since then has grown to over 70 million worldwide installations with a blogging platform that is easily a favorite worldwide. On the other hand, Squarespace is a newer website builder with a very rapidly growing base of users and some of the most powerful tools on the market in which to build a powerful website with. The main, stand out difference between these two giants is that WordPress remains free for it’s users while Squarespace does charge a fee. For many internet users looking to build a great website, cost will always be a factor. Although WordPress is free to use, there are fees associated with running a website from WordPress. There will always be a charge for website hosting. Some of the more cost effective hosts can charge a small fee of $5 a month, but this is a case of “buyer beware”. Using a host based solely on cheapest cost usually ends in costing the website owner time and money. Squarespace also throws in a free domain name with their annual subscription while WordPress requires it’s users to purchase their own domain name. When it comes to themes and plugins, WordPress has thousands of free themes you can choose from, while the purchase of Squarespace includes about twenty four templates and a couple of great and fully functional plugins. The most surprising thing about the cost of these website builders is that it is essentially the same. When totaled up, the hidden costs in WordPress equals the price of purchasing Squarespace. Even experienced computer gurus occasionally need support, and Squarespace has an amazing 24 hour support team to call. Like most paid for computer software, help is also provided to answer any questions and help trouble shoot any problems. WordPress does not have a live support team, but there is a help and message board that users can go to. Unfortunately, this is not a lot of help for beginners who have questions about everything. While the chat boards can offer some advice, it is usually spotty and confusing. For many internet users looking to build high quality professional websites, it is not a question of cost so much as a question of performance. Although Squarespace isn’t designed to handle large volumes of suddenly appearing traffic, it can handle a steady volume of traffic consistently. Using the cloud servers helps to keep the website fully functional at a steady and constant speed with almost no downtime or signs of slowing down. WordPress websites can handle those sudden influxes of traffic if the WordPress host is strong enough, most times it isn’t. This is where it pays to spend more on a strong web host. To avoid any issues with performance, Self-hosted WordPress users are frequently tweaking caching plugins to help handle the steady streams of information and visitors to the website. Performance issues for these two website builders depends on what a person needs from his/her websites. For larger websites though, WordPress is generally the better of the two especially when it is combined with a strong host. For those who are not great website builders, then purchasing Squarespace is probably the best option. Extremely easy to use and with great support at any time, even the most technically challenged can design a great website with the help of Squarespace. WordPress has gotten slightly easier to use in recent years, but for someone who is not familiar with everything entailed in building a website it can be difficult to use and understand. WordPress offers more flexibility than Squarespace, it is used across millions of blogs and you would find more options on themes, plugins and other solutions on WordPress. WordPress offers more customization options than Squarespace, allowing users more options. Both of these are powerful content management systems, and it simply comes down to a person’s need when it comes to choosing which company is best for them. WordPress is currently the top Content Management System for a reason, for a beginner or less tech-savvy person Squarespace might just be the perfect solution.